Vernon Corea created television history in Sri Lanka by being the first ever television presenter to been seen and heard in the first television transmission, conducted on an experimental basis by the Radio Society of Ceylon. The grainy black and white television pictures were broadcast on a locally made transmitter by the Radio Society of Ceylon on 15th June 1972. 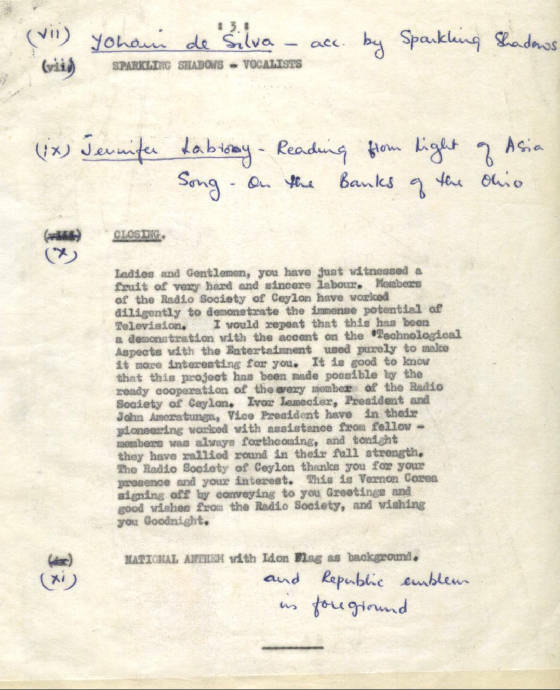 We publish the first script from that TV program broadcast at 8 pm on 15th June 1972. Sri Lanka enjoys a range of television programs from a number of TV stations operating from the island. The pioneer television presenter on that first TV program conducted on an experimental basis was Vernon Corea. 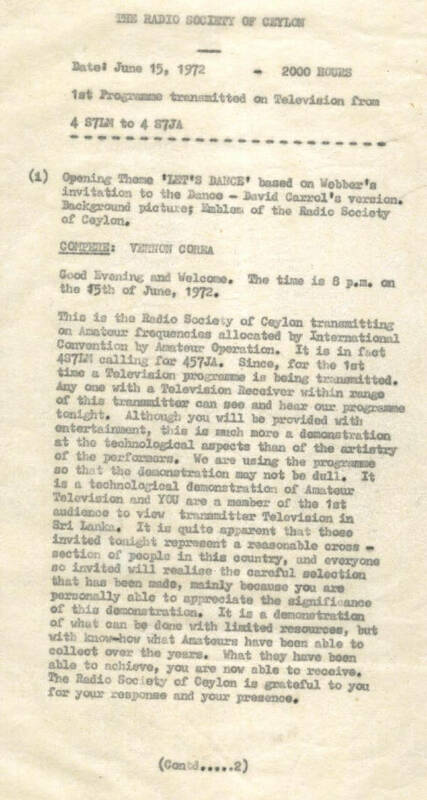 A formal resolution that a society of Ceylon Radio Amateurs be formed was duly adopted. In 1974 Radio Society of Ceylon became the Radio Society of Sri Lanka (RSSL).The RSSL was incorporated in 1990 as a company limited by guaranteed under the companies act. The RSSL has 210 members of which 120 are amateur radio license holders. The Radio Society of Sri Lanka looks after the interests of Radio Amateurs in Sri Lanka and represents them in matters affecting them to Telecommunications Regulatory Commission, Ministry of Interior and other Authorities. The RSSL also conducts classes for members who intend to sit Radio Amateur exam, outings, contests and field trips to enhance the knowledge of Amateur Radio and to promote fellowship among members. Members of the RSSL meet once a month at a General Meeting where they exchange views on various matters related to amateur radio. The first ever regular television transmission was conducted by the pioneering TV station ITN, from a small building in Pannipitiya, in Sri Lanka, on the 14th of April 1979. This was the beginning of the television age in Sri Lanka. The Government of Sri Lanka nationalised the business in June 1979. The second television station and the official Government tv station - Sri Lanka Rupavahini Corporation was launched in 1982.